Let’s get Whirly! 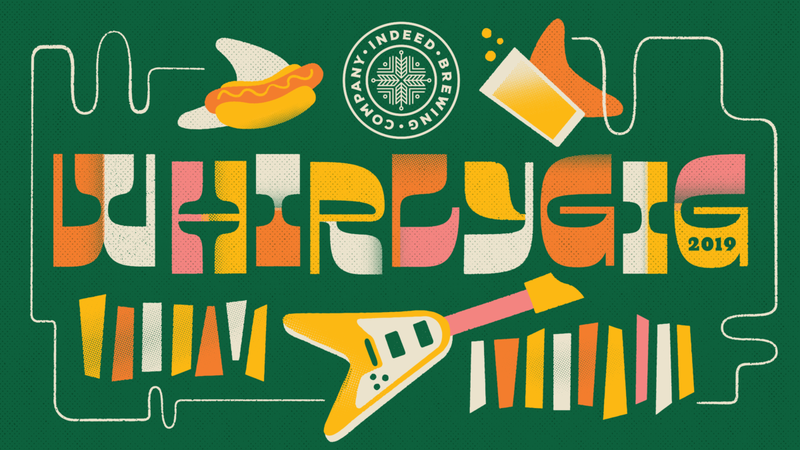 Our Art-a-Whirl® celebration, Whirlygig, is back for yet another year of delicious brews, tasty eats, and a fire music line-up including The Bad Man, Har Mar Superstar, and Pert Near Sandstone, with the full list below. We’re high-key so excited to share the news with you so keep scrolling for info on all the good times we’re about to have! Join us in the taproom, the Biergarten, or in the front row with your dancing shoes and a beer in hand. You’ll be sippin’ on the classics like Day Tripper Pale Ale, B-Side Pils, Lucy Session Sour, and Mexican Honey Imperial Lager alongside seasonals like Shenanigans Honey Wheat Ale, Peach Bum IPA, and the always anticipated, L.S.D. Honey Ale. Flavorwave IPA & Mexican Honey Light will make their first Whirlygig appearance, and we’re bringing out a couple of brand new selections for our favorite weekend of the year so stay tuned for more info to come on that. We will have a selection of non-alcoholic beverages available as well. Our long-time friends at Blue Door Pub are bringing their famous burgers alongside our pals at Natedogs out there slangin’ hot dogs. World Street Kitchen will be joining us for the very first time this year ready to fill your bellies with all the burrito deliciousness you can eat. And for our veggie friends, we will have dairy- and meat-free options. We’re very fortunate to have talented neighbors all around us who will be showing off their artwork for Northeast Minneapolis Arts Association (NEMAA) Art-A-Whirl®! Head to the upstairs floors in our home of the Solar Arts Building to find a diverse array of art or swing over to one of many other artist lofts within just a couple blocks of us. 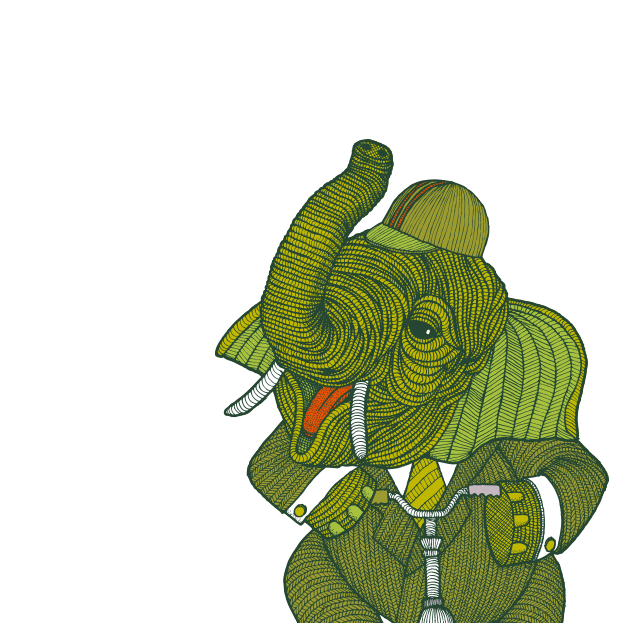 Our own Chuck U will be on-site creating a live painting of one of his unique and intricate pieces to be auctioned off on Sunday. 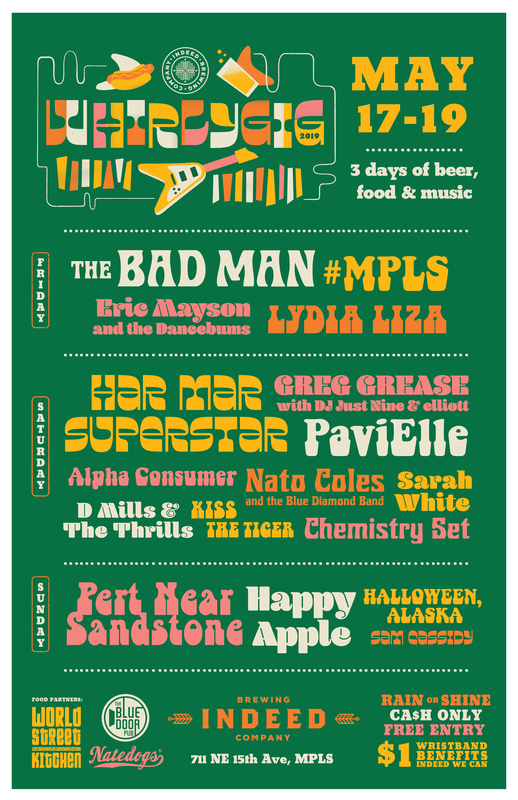 Without further ado here is your Whirlygig 2019 music line-up curated with Icehouse Minneapolis. Greg Grease w/ DJ Just Nine & elliott. Keep your eyes peeled for set times to come! Entry to this event is free and open to all ages, however, it will get crowded so keep an eye out for your little ones. As much as we’d love to pet all the dogs, we ask that you please leave them at home. Wristbands to drink are $1 daily and benefit our Indeed We Can charitable giving program. The event is entirely CASH ONLY, inside and out. We will have ATMs on-site but our pro-tip is to come prepared!